Clay Cooper is an old hat at monster killing. He used to be part of "Saga," the most legendary band of monster-slaying mercenaries ever. But now he is old, and his band mates are scattered around the world living the best post-hero lives they can with wives, children, and far less dragon killing than the good ol' days. Then, one night, Clay is on his way home from the bar and is met by an old leader of Saga, Golden Gabe. Gabe explains that his daughter Rose has grown up, and is as much of a hero as he ever was. She's a courageous fighter, and now people cheer her name when she comes into town. Only she's been captured. She is in a besieged city across the massive (deadly, monster-ridden) Heartwyld forest. The only way to save her is to get the old band back together for one final quest. I am always on the hunt for a good fantasy novel, and it seems like it's been a long while since I've read one that has captured me as completely as Kings of the Wyld. Nicholas Eames weaves together a story that is so full of heart, it will have you standing and cry-clapping by the end of it. Not only that, but he has put together a soundtrack for the book, so you can hear the music that inspired each chapter. A retired group of legendary mercenaries get the band back together for one last impossible mission in this award-winning debut epic fantasy. WINNER OF THE REDDIT/FANTASY AWARD FOR BEST DEBUT FANTASY NOVEL. Nicholas Eames was born to parents of infinite patience and unstinting support in Wingham, Ontario. Though he attended college for theatre arts, he gave up acting to pursue the infinitely more attainable profession of 'epic fantasy novelist.' Kings of the Wyld is his first novel. Nicholas loves black coffee, neat whiskey, the month of October, and video games. He currently lives in Ontario, Canada, and is very probably writing at this very moment. 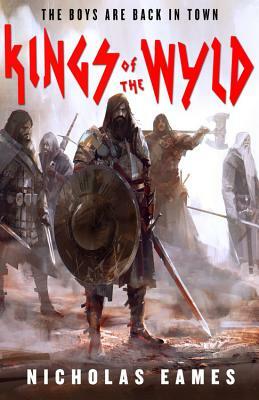 "Kings of the Wyld is gritty but not grim. It was a blast to read, from start to finish. The boys are getting the band back together, and woe be to anyone who stands in their way. Magic swords, broken promises, and some of the craziest action you're likely to read this side of the Wyld. Reading this book made me want to grab a sword and set off on an epic quest."